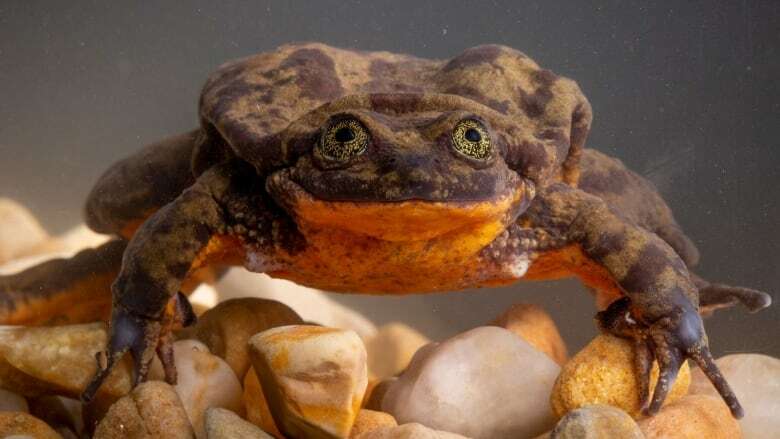 Romeo, who was long believed to be the last-known Sehuencas water frog, may have finally found his Juliet — and the fate of an entire species rests, at least in part, on their little green shoulders. Romeo the frog may have finally found his Juliet — and the fate of an entire species rests, at least in part, on their little green shoulders. 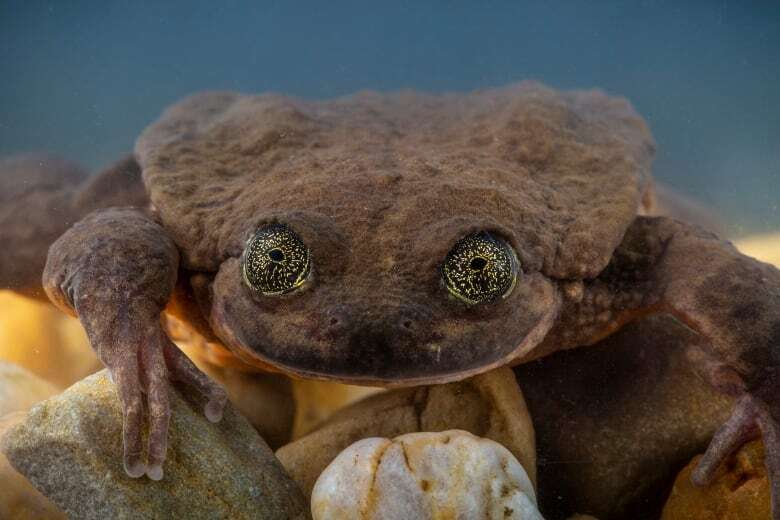 For the last 10 years, researchers have been trying to find a mate for Romeo, who was believed to be the last-known Sehuencas water frog. But conservationists recently discovered a small group of the rare amphibians during an expedition to a remote Bolivian cloud forest. They collected five of them for a breeding program — three males and two females, including Juliet. "We really can turn things around," Christopher Jordan of Global Wildlife Conservation told As It Happens host Carol Off. "I see Romeo and Juliet ... as kind of a symbol of hope in this time of mass extinction, that we're not too late to save these beautiful aspects of our ecosystem and our planet." Sehuencas water frogs have been threatened by invasive fish species, a deadly fungal infection, and widespread destruction of their natural habitat due to deforestation and development. Until this latest expedition, none had been seen in the wild for more than a decade. Romeo was believed to be the last of his kind, residing alone in an aquarium at the Museo de Historia Natural Alcide d'Orbigny in Cochabamba, Bolivia. Conservationists spent much of 2018 scouring Bolivia's streams and rivers in search of a mate for Romeo. In one fundraising and awareness campaign, they launched a dating profile for Romeo on the dating website Match.com, which described him as "not picky." He also has his own Twitter account, where he is described as "the world's loneliest frog." Now Juliet is on her way to Romeo — though it's not yet clear whether the pair will hit it off. "Romeo is very shy. He doesn't come out very often. He stays under his shelter," Jordan said. "He's been kind of a reluctant star, a reluctant celebrity." Juliet, on the other hand, is "very, very active," swimming around her tank and making several daring escape attempts, he said. "We're really hoping in this case that opposites attract," Jordan said. That may seem like a lot of pressure for two little frogs, but Romeo and Juliet aren't the last hope for their species. 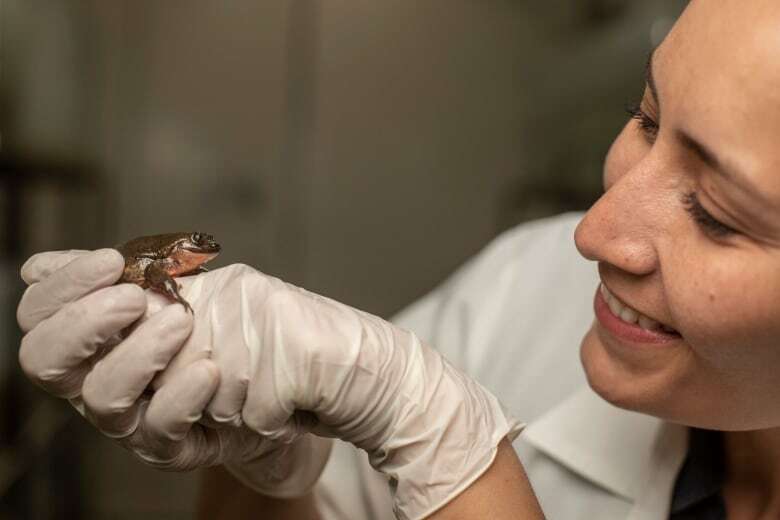 Thanks to this latest discovery, conservationists will be able match multiple breeding pairs at the museum's K'ayra Center for Research and Conservation of Threatened Amphibians of Bolivia. And the expedition team will keep searching for more frogs. "In my mind, the investment is worth it to bring such a beautiful species back," Jordan said. "The DNA contains millions and millions of years of evolution, and it's something really, really special and if we can prevent this extinction and commit to preventing this extinction, I think it's worth it." Written by Sheena Goodyear. Interview with Christopher Jordan produced by Ashley Mak.